Born and raised in New Orleans, W1DAN caught the shortwave bug in the early 1970s as he discovered listening to shortwave broadcast stations, but soon found the BFO switch of his Hallicrafters S-120. Here Dan discovered hams not only discussing the latest football game and weather, but also of homebrewing tube amplifiers and modifying rigs. 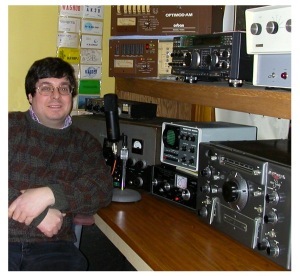 Always a tinkerer, Dan soon built a couple of accessories, obtained his license in 1978 and got on the air on CW with a Heath Apache and Hallicrafters SX-101A-and modified them. Since that time he has enjoyed not only the vintage gear and the AM mode, but modern Software Defined Radios with DSP, Class E RF amplification as well as digital modes such as PSK-31. While he does not claim to know everything about radio he is happy to assist fellow hams with technical questions. W1DAN is also the president of the Wellesley Amateur radio Society, works as a broadcast engineer in Boston and lives in Natick, MA.